The monthly ArtSmart Roundtable brings together some of the best art-focused travel blogs to post on a common theme. This month we are discussing the 2015 Art Outlook. Check out all the stories below! If you’re like me, then you spend January contemplating where to go in the New Year. Do you plan several small trips close to home, or is this the year of the big, adventure getaway? While you think about that, let me try to tempt you with a few art pilgrimages options to see one of the greatest painters of Western Art – Vincent Van Gogh. In honor of the 125th anniversary of his death this year, several superb museums in the Netherlands, Belgium, and France will be hosting events and exhibits celebrating his unique and visionary art. After contemplating becoming a teacher or a preacher, Vincent Van Gogh (1853 – 1890) finally decided at age 27 to become an artist. In just ten years of active work, he created an extensive and exquisite catalog of paintings that continues to inspire viewers today. Applying thick coats of paint and using short fluids brush strokes, even Van Gogh’s still life and landscape paintings appear to dance and swirl. Obsessed with color, his paintings are bold, bright, and elegantly composed, balancing complimentary hues in a single canvas. For as valuable as his pieces are today. Van Gogh was a commercial failure during his lifetime. While almost every international art museum has a piece by Van Gogh, there is something magical about seeing his paintings in their original environment. Van Gogh 2015 seeks to tell the story of Vincent Van Gogh in the towns and areas where he lived and worked. From the bleak winter fields of the Netherlands and Belgium, to the blinding fertility and color of Southern France, you can still find these places today. Van Gogh’s genius was to see these landscapes and interpret them with emotion and vigor unmatched by any artist before or since. The Van Gogh Museum in Amsterdam is the ultimate stop for anyone who wants to learn more about Vincent. They have an extensive collection of his pieces but more importantly, they do an excellent job interweaving the art with biographical details, Van Gogh’s artistic influences, and analysis of his pieces. I visited an abbreviated version of the museum in the Spring of 2013 while it was undergoing renovations and was really impressed. I particularly like the galleries dedicated Van Gogh’s exploration of Japanese woodblock design elements. Their innovative approach to teaching about art can also be experienced with the very cool interactive exhibits on their website. The Van Gogh Museum will also be showing Munch : Van Gogh opening 25 Sept 2015 which is the first major exhibit comparing these two artists. Given their innovative visual styles and psychological paintings, this should be an excellent addition to the Van Gogh 2015 celebration. 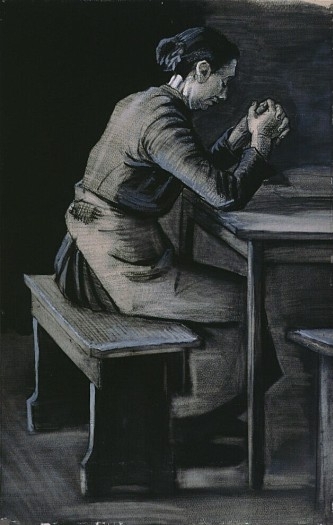 Vincent Van Gogh – “Gebed voor de maaltijd (Prayer before meals)” 1882, pencil & watercolor, Kröller-Müller Museum. 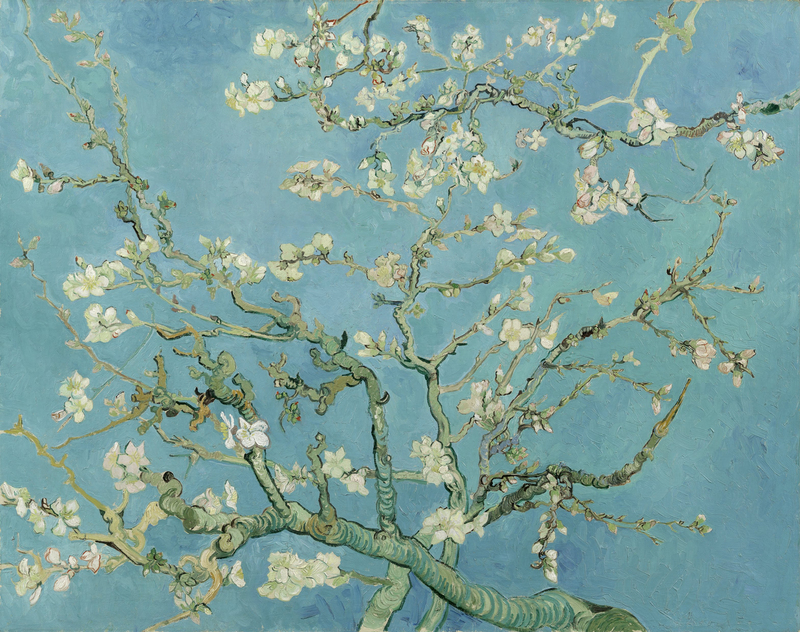 The Kröller-Müller Museum has on display over 50 paintings and drawings by Van Gogh as well as works by his contemporaries to provide context and explore those artists which influenced him. 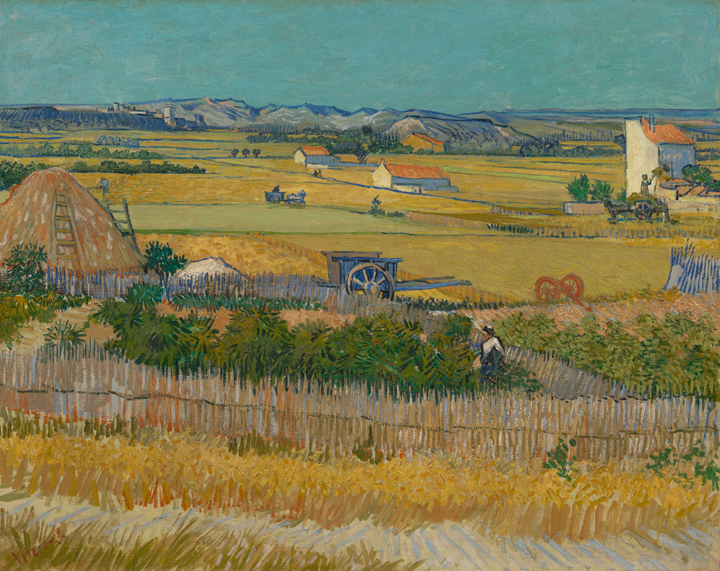 During the summer months (June to September), the museum will be hosting a food festival, a “Paint like Van Gogh” event, and music and theater performances inspired by Vincent. 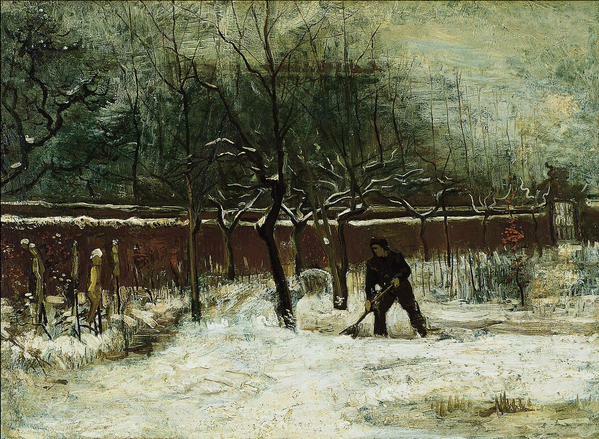 Vincent Van Gogh painted “Winter (The Vicarage Garden under Snow)” in Nuenen in 1885. (Norton Simon Museum, Pasadena, CA). You might be able to find these trees and fence there today. The Van Gogh Village, Vincentre and Outdoor Museum, Nuenen will be sponsoring an outdoor painting festival May 17-18 so you can try to capture the same fields, objects, and buildings that van Gogh painted! The Vincent Van Gogh Huis in Zundert will be hosting an monthly artist-in-residence who will live and paint in Vincent’s childhood home. The Het Noordbrabants Museum will use their collection and interaction displays to explain Van Gogh’s artistic development. 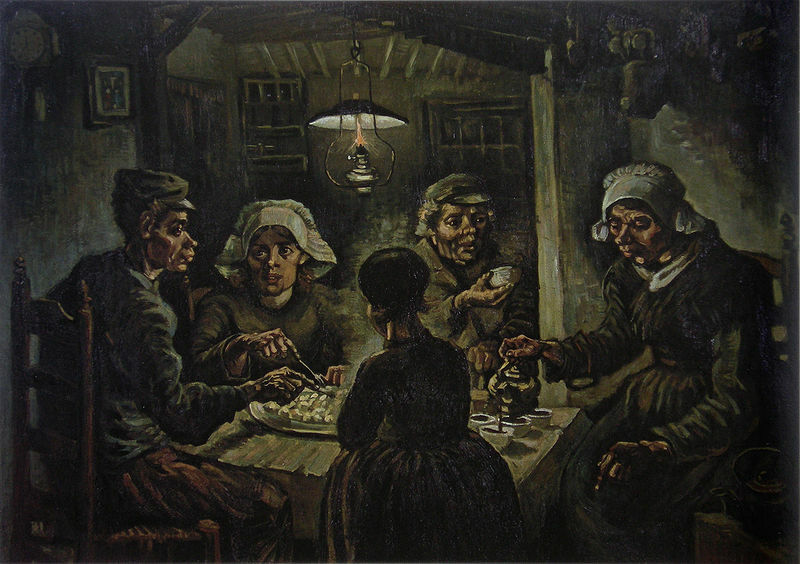 Vincent van Gogh’s famous image of peasant life “De Aardappeleters (The Potato Eaters)” (Van Gogh Museum, Amsterdam). Much of Van Gogh’s early work explored the peasant life he observed while living (1878-1880) in the Borinage area of Southern Belgium. 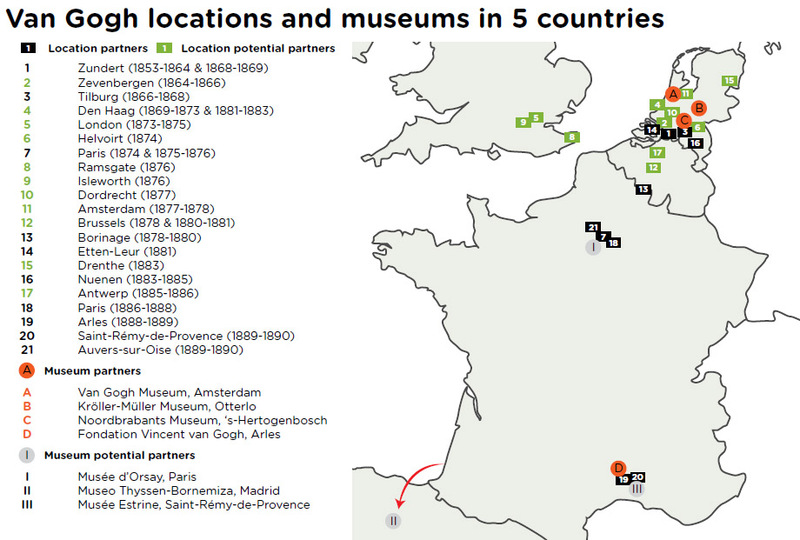 As part of their tenure as a 2015 European Capitol of Culture, the Fine Art Museum in Mons will be exhibiting pieces inspired by the region. Additionally, two homes in nearby Cuesmes and Wasmes once occupied by van Gogh have also restored and opened to the public. While the van Gogh museums in Southern France are small, it’s worth visiting Arles and Saint-Rémy-de-Provence just for the ambiance. Van Gogh only lived in year in each village but they inspired some of his most memorable paintings. He envisioned the landscape in vivid complementary colors and often revisited the same scene painting multiple versions A true art pilgrimage would include walking through the olive tree groves, wheatfields, and churchyards that so moved Van Gogh. 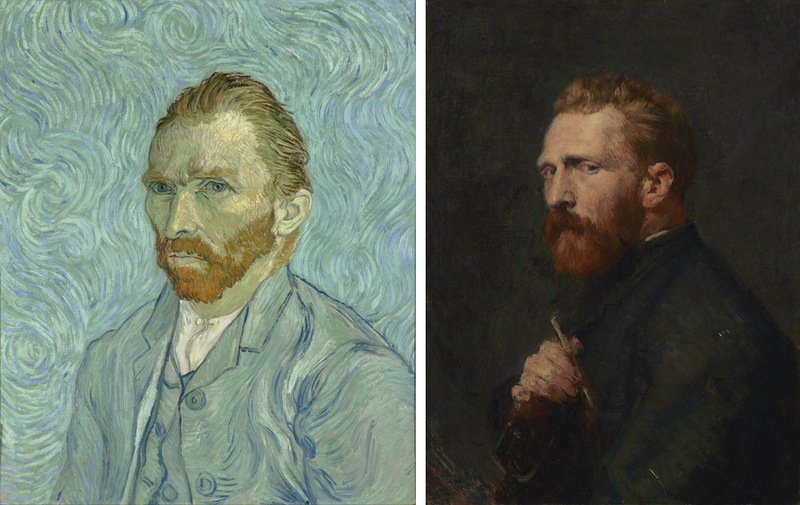 To get all the details, check the Van Gogh Europe website or look for events in the Netherlands, Belgium, and France. Thanks for this, Christina! The Kroller-Muller is a favorite museum of mine, both for the collection and the lovely forest setting. A must-read for anyone on the Vincent trail is Van Gogh: The Life by Steven Naifeh and Gregory White Smith. This 2012 bio is both comprehensive and entertaining. Highly recommend! Thanks Lesley! I’ve never been to the Kroller-Muller but its definitely on my list. I’ve been meaning to read that biography as well but keep putting it off because its ~800 pages long 🙂 Someday soon…. Yes the Van Gogh Museum is a great place. As first time visitors to Amsterdam we made the right choice of spending a fair part of a day in and around this fantastic museum. Great! 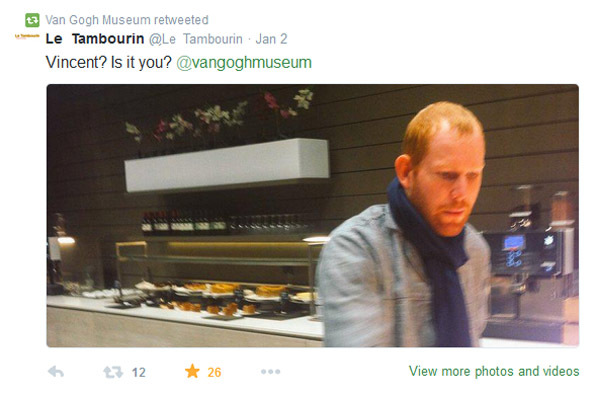 I’m glad you had a wonderful visit to the Van Gogh Museum! Thanks for posting this, Christina! I’m heading to Paris in a few months and will definitely check out the special events being held there. Van Gogh is a favorite artist of mine!